It really isn’t difficult to see how and why their tale has become so romanticised. They were the glamourized image of villains during the Prohibition era, a total contrast with the stark reality of Hoovervilles and a population with anti-government sentiments. The media portrayed them as a fantasy of young love and a care-free life-style, two things which appealed immeasurably to the nation during the Great Depression. They newspapers sold them by exposing them as Robin Hood/Jesse James figures, with a whole lot of “stick it to the man” attitude. However, in reality their 2 year crime spree involved knocking off more Mom-and-Pop stores than bank heists, and Clyde’s driving skills looking like an audition for Dukes of Hazard. Wallis Simpson is a figure of great scandal in British history. An American socialite in the process of obtaining her second divorce, she won the love of a King (Edward VIII) so violently that he was willing to abdicate his throne. The void in power was filled by his brother Albert, as seen in The King’s Speech. This is the stuff fairy tales are made of. The fact that this article is focusing on the celebration of love causes me to politely ignore that she was a fan of the Führer. Peter allegedly had Inês de Castro’s body exhumed and crowned Queen of Portugal, forcing the clergy and nobility to kiss the bones of her hands. Posthumously crowned Queen of Portugal, Inês de Castro, inspired lasting devotion in her then Prince, Pedro. Even though she was lady-in-waiting and cousin to the Princess she was not deemed suitable by King Alfonso IV, given her ties to Castilian royalty, and was banished from court. After the death of his wife, Princess Constance, Pedro went to fetch Inês and the two lived together in the Monastery of Santa Clara-a-Velha, where she bore him 4 children. However, everything was far from rosy. Later, in the same monastery, she was beheaded in front of her children’s eyes, under the orders of the disapproving King Alfonso IV. When Alfonso died and passed the crown onto Pedro, he enacted vengeance and executed his lover’s assassins by ripping their hearts from their bodies. After revenge was taken he had Inês’s corpse relocated from the monastery of her death to that of the Kings. Some legends say her body was dressed in royal garb and seated upon the throne where the court was forced to swear allegiance by kissing her hand. This intense faithfulness has captured the imagination of poets and screenwriters for centuries. Andrew and Rachel in earlier, and happier, days before the vicious elections of 1824 and 1828. The Hermitage appears in the background. 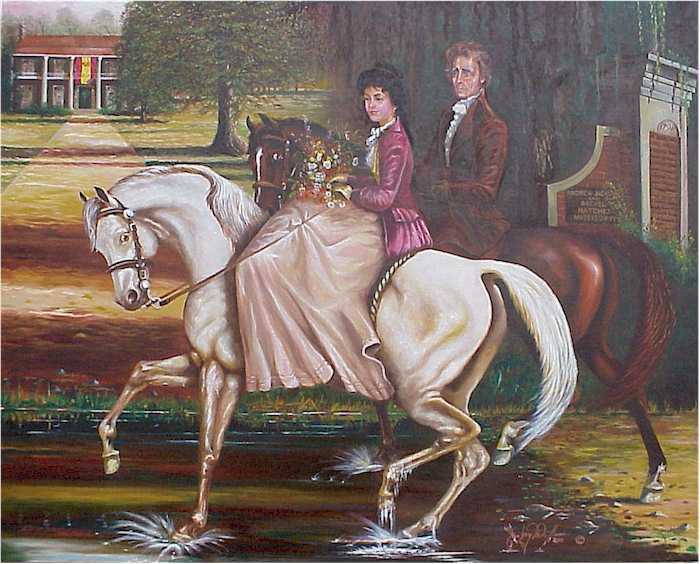 Andrew Jackson’s first Trail of Tears was the death of his wife Rachel. She passed a month after his election as President. Andrew, who had always been violently protective of her reputation (even killing a man in a duel over an insult) blamed the vicious tongues in campaign propaganda for her passing and refused to meet with John Adams for the traditional “changing of the guard”. Accusations of adultery and bigamy stemmed from the fact that Rachel’s first husband never filed the paperwork necessary for the divorce, which led to the couple living together for 3 years in a false marriage. At her passing, Jackson was devastated, convinced she would awaken and stayed beside her body all night. In the 1600’s during the Mughal empire, a time known for its political marriage, a Prince found genuine love with his third and favourite wife: Mumtaz Mahal. Their affection for each other was a notable contrast to the politically advantageous unions which were not only common, but essential to the continuation of a reign. She was his constant companion during political travels abroad and his military campaigns, despite her 14 pregnancies! He even trusted her with his imperial seal. Their love story would become carved out in white marble over the course of 21 years into what is now recognized as THE architectural PDA of the world: The Taj Majal, which is in reality a mausoleum which the then emperor Shah Jahan built as a resting place for his “Chosen One of the Palace”.